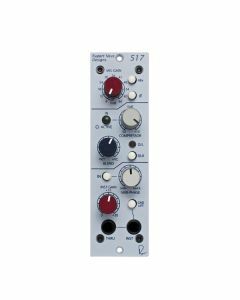 Based on the Portico 5017 Mobile Pre, the 517 provides world-class transformer-coupled micpreamp, compressor and DI circuitry with Vari-phase, “Silk” and DI/mic blending capabilities – all in a single 500 series module. Much could be written about this feature. Suffice it to say, it gives a subtle option to enhance sound quality in the direction of vintage modules. The silk button reduces negative feedback and adjusts the frequency spectrum to provide a very sweet and musical performance. Mic gain is from 0dB to 66dB overall gain. DI Gain is from 0dB to 30dB. Balanced or unbalanced Hi-Z input for instruments. Reverses the polarity of the mic input. When signals exceed the "threshold"Â level, the gain is reduced at a controlled 2:1 ratio, with fixed attack and release time constants. Maximum Output Level: Maximum output from 20 Hz to 40 kHz is +23 dBu. Crosstalk: Measured channel to channel: Better than –90 dB @ 15kHz.